Without fanfare, the U.S. government removed many intrusive regulations affecting oil and gas. Much further remains to be done. Regulation of environmental problems and public utilities remains deficient. Special attention is needed to the enthusiasm over the actual U.S. oil stockpiling program and proposed oil-import taxes. The arguments that oil is particularly insecure, that the insecurity produces severe macroeconomic damages, and that oil market policies are the best response are all dubious. In particular, design of such intervention is even more difficult than implementing traditional monetary and fiscal policy. International trade economics warns of the perils of taxing to create or offset monopoly. Stockpiling also is designed to offset the disincentives to private stockpiling -created by the tendency to impose price controls during crises. The fear of windfall profits that inspires price controls also discourages stockpile release. Stockpiling thus may not prove helpful. The U.S. establishes goals for its public lands more ambitious than can be attained with the budgets allocated for administration. Reversing the retreat from encouraging sales to the private sector could improve land use. Since 1960 the Soviet Union has been, for all practical purposes, Cuba's exclusive supplier of energy products. For certain time periods, Soviet sales of oil and oil products to Cuba were made at concessional prices; prior to 1991, they were priced using transferable rubles and were essentially bartered for Cuban goods, especially sugar.Effective January 1, 1991, the Soviet Union shifted to world market prices and convertible currency payments for all traded commodities, including energy products. The shift to market prices and convertible currencies in CubanSoviet energy trade has already brought-or is likely to bring a number of adjustments in four areas: 1) the trade balance; 2) the ability to reexport oil and oil products; 3) energy consumption patterns;. 4) and the structure of energy supplies. We use information reported by ten utilities about their electricity conservation programs to calculate the life-cycle cost per kWh saved - the cost of a "negawatt " -- associated with these programs. 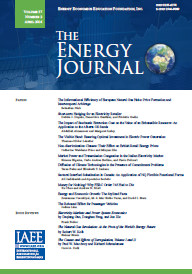 These computations indicate that the cost associated with utilities "purchasing" negawatthours is substantially higher than implied by standard sources such as Amory Lovins (Rocky Mountain Institute) and EPRI. The costs calculated for residential programs, in particular, are much higher than conservation advocates have suggested. However, 80% of the expected savings from these programs are attributed to commercial and industrial customers rather than residential customers. We find substantial variation in costs between utilities for similar programs as well as significant intra-utility variation in the cost associated with various sub-programs. We proceed to examine whether or not there are any systematic biases in the reporting of costs and energy savings by the utilities in our sample. In many cases, utilities fail to report all relevant costs, rely on engineering projections of savings rather than applying methods to measure savings based on actual experience, and fail to make appropriate adjustments for free riders. Further biases may result firorn adopting measure lives that are too long. As a result, on average the cost of a negawatthour computed from utility reports significantly underestimates the true societal cost of conservation achieved this way. Mile it is difficult to compute the underestimate with any precision, the evidence that we have suggests that computations based on utility expectations could be underestimating the actual societal cost by a factor of two or more on average. Better utility cost accounting procedures and the application of more sophisticated methods to estimate actual energy savings achieved are clearly necessary before large sums of money can be expended wisely on these programs. More U.S. utilities are running more and larger demand-side management (DSM) programs. Assessing the cost effectiveness of these programs raises difficult questions for utilities and their regulators. In particular, should these programs aim to minimize the total cost of providing electric-energy services or should they minimize the price ofelectricity?Most of the debates about the appropriate economic tests to use in assessing utility programs do not address the magnitude of the impacts. As a result, questions remain about the relationships among utility DSM programs and acquisition of supply resources and the effects of these choices on electricity prices and costs. This study offersquantitative estimates on the tradeoffs between total costs and electricity prices. A dynamic model is used to assess the effects of energy-efficiency programs on utility revenues, total resource costs, electricity prices, and electricityconsumption for the period 1990 to 2010. These DSM programs are assessed under alternative scenarios for three utilities: a "base" that is typical of U.S. utilities; a "surplus" utility that has excess capacity, few planned retirements, and slow growth in fossil-fuel prices and incomes; and a "deficit" utility that has little excess capacity, many planned retirements, and rapid growth infossil-fuel prices and incomes. Model results show that DSM programs generally reduce electricity costs and increase electricity prices. However, the percentage reduction in costs is usually greaterthan the percentage increase in prices. On the other hand, most of the cost benefits of DSM programs can be obtained without raising electricity prices. Cet article analyse la relation entre la fiscalit� p�troli�re et le partage des risques entre les gouvernements des pays h�tes et les compagnies internationales. L'analyse met en �vidence que la taxation a une influence sur les risques g�ologique et politique. Ces deux manifestations sont estim�es dans le cas des pays producteurs dAfrique de l'Ouest. Il se d�gage que les fiscalit�s trop lourdes et r�gressives augmentent fortement le risque support� par les deux partenaires. La progressivit� de la taxation est une condition n�cessaire mais non suffisante pour r�duire les risques public et priv�. Un fardeau fiscal bien �quilibr� entre petits et grands gisements est la meilleure mani�re de r�duire, le risque d� � l'imposition. Les pays producteurs de cette r�gion ont fait des progr�s importants dans la construction des syst�mes fiscaux neutres � l'�gard du risque, mais dans la plupart des cas, il reste des progr�s � faire. This study starts from the observation that today's Western trading nations are exposed to multiple risks of energy supplies, e.g. simultaneous shortage of oil and electricity supplies. To cope with these risks, oil can be stockpiled as well as domestic capacity for power production built up. Adopting the viewpoint of a policy maker who aims at minimizing the expected cost of security of supply, optimal simultaneous adjustments of oil stocks and electric production capacities to exogenous changes such as economic growth are derived. Against this benchmark, one dimensional rules such as "oil reserves for 90 days" turn out to be not only suboptimal but also to foster adjustments that exacerbate suboptimality. In a disturbing assault on intuition and conventional wisdom, Khazzoom and Brookes have asserted that energy efficiency improvements might increase, rather than decrease energy consumption. If true, policies aimed at encouraging conservation could worsen rather than ameliorate global warming and would accelerate the need for offshore drilling rather than provide a substitute for it. More generally, this result would pit conservation against environmental goals, in direct contradiction to many countries' energy plans (which see conservation as an environmental solution).Yet neoclassical growth theory confirms this possibility given certain fairly reasonable conditions-conditions that recent work by Hogan and Jorgenson indicates may hold in the U.S. economy. By no means proving the postulate, this analysis appears to make it much more difficult to dismiss.In fact, the effect can be more dramatic than even Khazzoom and Brookes may appreciate. Energy efficiency gains can increase energy use even more directly by increasing the economic growth rate, not only by decreasing the effective cost of energy. Efficiency gains for other factors (capital and labor) can also increase energy use. A flexible double-logarithmic function form is developed to meet assumptions of consumer behavior. Then annual residential and commercial data (1970-87) are applied to this functional form to examine demand for petroleum products, electricity, and natural gas in California. The traditional double lo-linear functional form has shortcomings ofconstant elasticities. The regression equations in this study, with varied estimated elasticities, overcome some of these shortcomings. All short-run own-price elasticities are inelastic and all income elasticities are close to unity inthis study. According to the short-run time-trend elasticities, consumers' fuel preference in California is electricity. The long-run income elasticities also indicate that the residential consumers will consume more electricity and natural gas as their energy budgets increase in the long run. We review a number of methods that have recently been proposed to decompose changes in industrial energy consumption. We then propose two parametric methods based on the Divisia index, where the integral path problem in the Divisia index is transformed into a parameter estimation problem. It is shown that there can be an infinite number of sets of decomposition results, each corresponding to a particular combination of parameter values, and that several recently proposed methods are in fact special cases of these two methods. We then introduce an approach to estimate the parameter values uniquely. Referred to as the Adaptive Weighting Divisia Method, this method is supported by vigorous mathematical analysis and does not involve arbitrary guesses of parameter valuesas is the case for the existing methods. We also discuss the application and the associated statistical problems of the various decomposition methods, and present the results of a study using the data for Singapore industry. This paper describes a framework for analyzing the imperfect pricereversibility ("hysteresis") of oil demand. The oil demand reductions following the oil price increases of the 1970s will not be completely reversed by the price cuts of the 1980s, nor is it necessarily true that these partial demand reversals themselves will be reversed exactly by future price increases. We decompose price into three monotonic series: price increases to maximum historic levels, price cuts, and price recoveries (increases below historic highs). We would expect that the response to price cuts wouldbe no greater than to price recoveries, which in turn would be no greater than for increases in maximum historic price. For evidence of imperfect price-reversibility, we test econometrically the following U.S. data: vehicle miles per driver,the fuel efficiency of the automobile fleet, and gasoline demand per driver. In each case, our econometric results allow us to reject the hypothesis of perfect price-reversibility. The data show smaller response to price cuts than to priceincreases.This has dramatic implications for projections of gasoline and oil demand, especially under low-price assumptions. Econometric energy models are used to evaluate past policy experiences, assess the impact of future policies and forecast energy demand. This paper estimates an industrial energy demand model for the province of Ontario using a linear-logit specification for fuel type equations which are embedded in an aggregate energy demand equation. Short term, long-term, own- and cross-price elasticities are estimated for electricity, natural gas, oil and coal. Own- and cross-price elasticities are disaggregated to show the overall price elasticities and the "energy-constant" price elasticities when aggregate energy use is held unchanged. These disaggregations suggest that a substantial part of energy conservation comes from the higher aggregate price of energy and not from interfuel substitution. Back Matter: Book Reviews, etc.